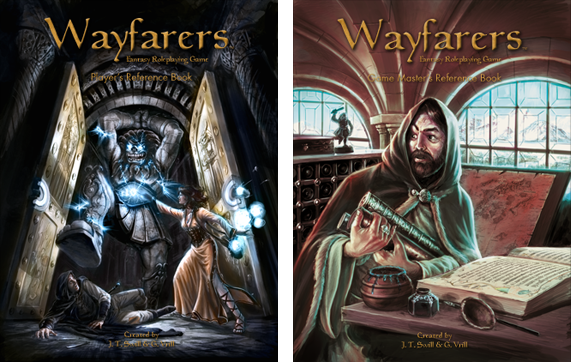 04/03/12: Wayfarers is now available from Mongoose! Posted: Tue Apr 03, 2012 8:45 am Post subject: 04/03/12: Wayfarers is now available from Mongoose! Thanks everyone so much for their patience, support, help and advice in this process! I had to email Mongoose Sales and ask when I should expect my books since I preordered the 1 book when it was first posted. I was copied on an email to another Mongoose employee who was asked to get me my books. Hopefully noone else that preordered the combined books has to ask them to send them. Hm. I'll check in with them and make sure that this isn't the case. I didn't hear from them neither. I contacted Mongoose. If you preordered the single book version, the Player's and GM books should be sent to you. This should all be handled automatically - however, the US warehouse is currently swamped, so orders on that side of the ocean may be slow going out. Will all be sorted in a week or two. Let me know if this isn't the case. I'm waiting on my books too, btw. Recieved my new Players Guide but not the GMs Guide. Emailed Mongoose to see if there was a delay in shipping the GM guide or if they just didn't send it. I did pre order the original combined book. We shall see. I got that cc. Let me know if you don't get a book or response soon. I actually got my GM guide, but not my Player's. :/ That's being fixed. Not sure what the issue is there. I have the impression this is a State-side thing. Recieved an email from Kelly George at Mongoose this morning. Says it will be on the way. Groovy. Let me know if there is any problem. Just checked my email and the book is on its way! Just received my GM guide! Order complete. Awesome. I just got my copies. I just got my copies and they are looking good! Awesome. I was just about to inquire with you. I have finally submitted my review to RPGnet. It took me some time to reformat it for their site but it is done. I don't know when it is going to be published yet.